Arnhim Eustace, Opposition Leader and president of the New Democratic Party (NDP), said that more supporters than those who turned out at Parliament last week are expected to be present when the House of Assembly resumes on Tuesday, February 8. He said that supporters are being mobilized to turn out in their numbers as the party plans to stage a bigger demonstration on the streets of Kingstown. Eustace spoke to SEARCHLIGHT in front of the Administrative Building on Bay Street, Kingstown, on Wednesday, February 2, as he and the six other elected members of the party, as well as the partyâs two nominated members, picketed the Complex, where a LIAT Heads of Government meeting was taking place upstairs. They were joined by a number of party supporters. The Opposition Leader said that their presence there was in protest of the Criminal Procedure Code (Amendment) Act which was passed last week, and the Representation of the People Act which will be considered next week. âWe are going to continue to protest these Bills, and there are other issues in this country which are a bother to us, and we will continue to speak about them,â Eustace added. 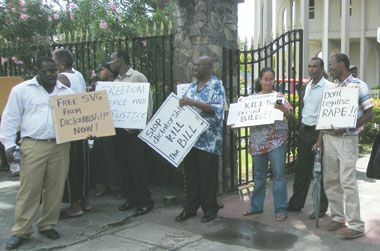 As in Parliament, Eustace repeated that the Bills, which he believes diminish the rights of Vincentians, will not be accepted by his party and its supporters. He said that while the Criminal Procedure Act has been passed in the House, it has not been signed by Governor-General Sir Frederick Ballantyne, which would officially make it law. He said he hoped that Sir Frederick had refused to do so. Eustace said that he believes that the Representation of the People (Amendment) Bill is just an effort by the Unity Labour Party administration to protect themselves. The Opposition Leader pointed out that the picketing parliamentarians were not wearing the partyâs colour that day, since they did not see the issue as a party one but one of national importance. He said that the party will continue to raise public awareness on the Bills and other matters, by using radio and television broadcasts, whistle stops and more protests. Meanwhile, General Secretary of the Unity Labour Party Julian Francis indicated that while there has been no decision on whether ULP supporters will be called out to show support to the government next Tuesday, he will not condone what he considers as the âlawlessnessâ of the NDP. According to Francis, the decision will be made following a series of meetings this week, and a rally on Sunday at Biabou. Francis said that all strategies attempted by the Opposition in the past have failed, and this only lends to poor leadership. âI donât intend to leave the town to the NDP,â Francis concluded.